To finish off our weekend roundup – we couldn’t relegate Aberdeen and Inverness to just a few lines of our report on Saturday’s events. The organisers in both cities have done an amazing job despite a less co-operative council (in Aberdeen) and a very short time (in Inverness). Even without closed roads, both of our northern PoPs still managed to fill the streets with a huge range of bikes and people on them. We can only hope the effort pays off in real change right across Scotland, not just in the central belt. 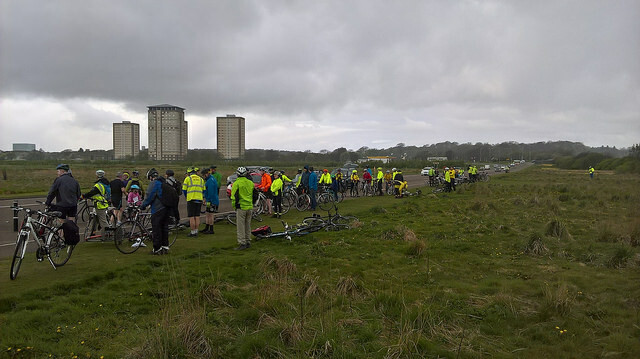 Aberdeen kicked off first, with about 75 people departing from the esplanade in the rain and arriving at Castlegate in glorious sunshine having picked up more on the way! 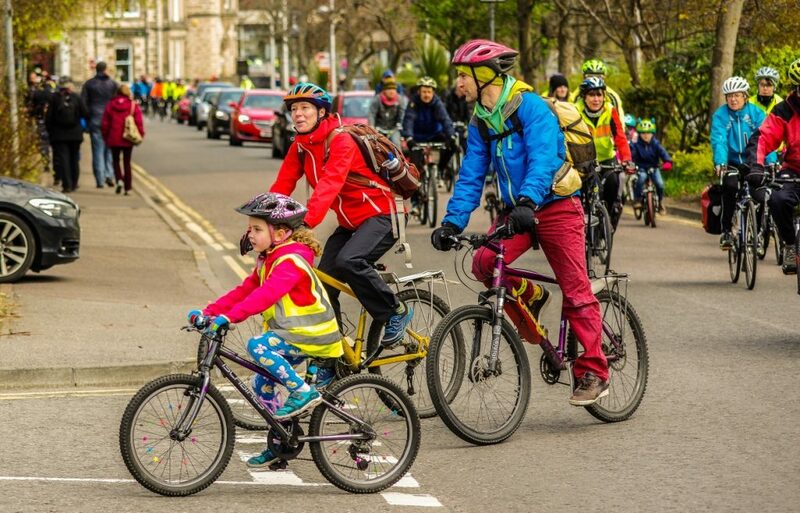 In the end about 100 cyclists, including many families, joined the Aberdeen Cycle Forum who organised the event. This is despite challenging conditions for cycling in Aberdeen! 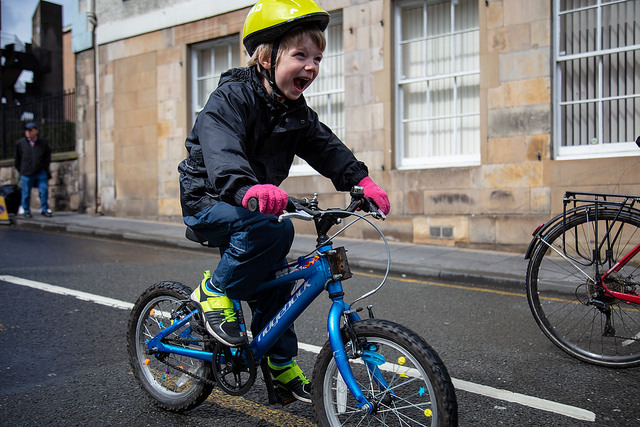 Unfortunately, it was not possible to get agreements to close the roads – which would have meant a bigger turnout and made it possible to take the ride more visibly through the city centre. Henri De Ruiter, one of the organisers, addressed the crowd briefly “Everyone here should feel encouraged by being part of a wider, national movement with thousands of people riding today and demanding better cycling infrastructure.” Although no politicians addressed the event, the leader of the council, Jenny Laing, and the finance convener, Willie Young (both Labour party councillors) did turn up, and participants had a chance to talk to them. 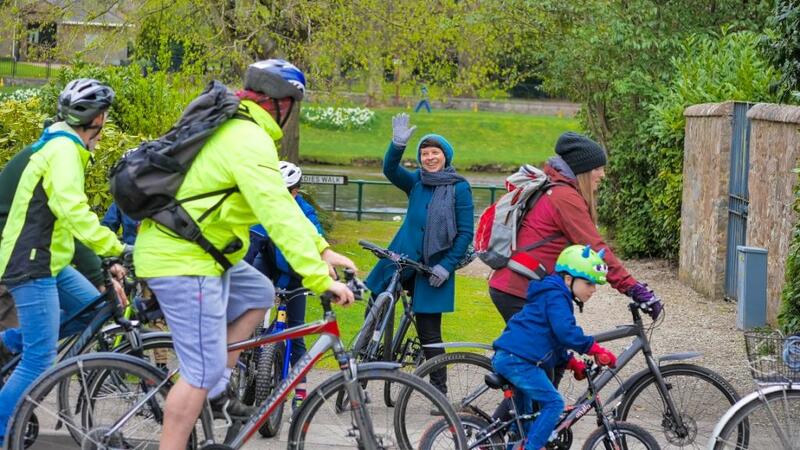 Afterwards, the bike racks outside pubs and cafes were full as the crowd showed that encouraging cycling can benefit local businesses! 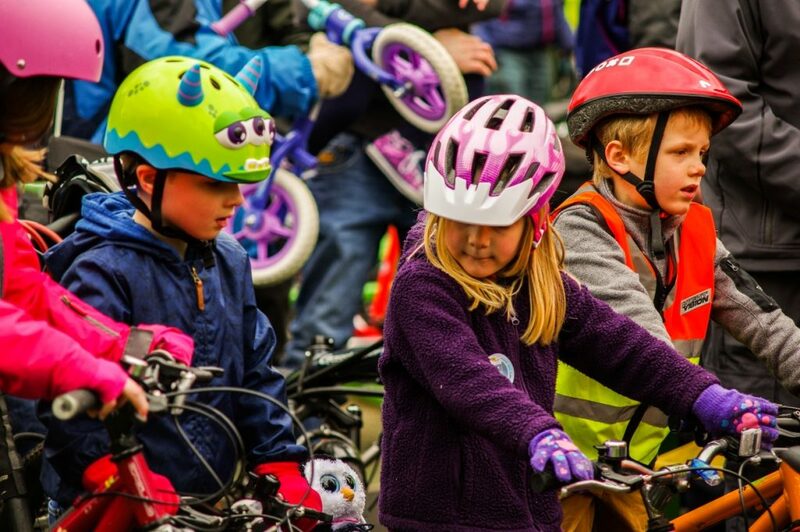 Inverness followed shortly afterwards at 11:30 and the city’s streets were packed with riders and walkers as more than 120 people set off from Bellfield Park on a variety of bikes – from kids on their first bikes to recumbents, tricycles, tandems and tagalongs. 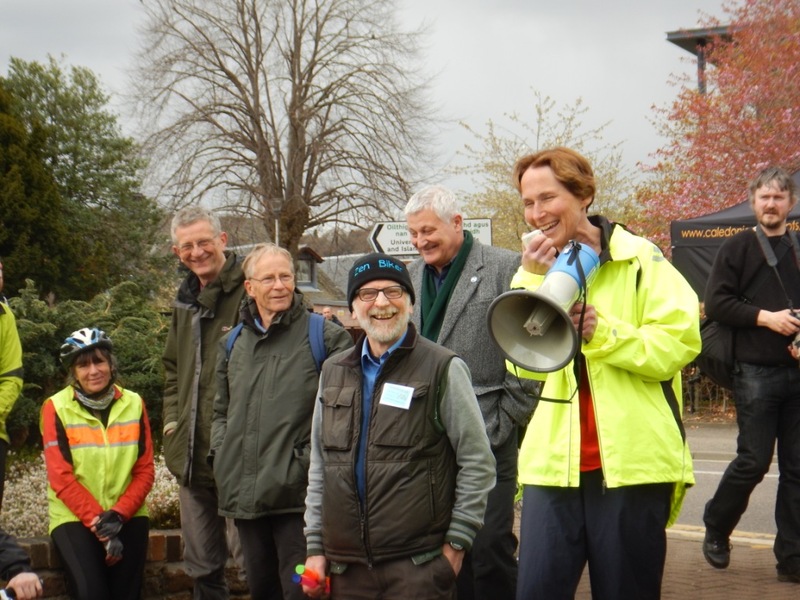 After crossing the Ness Bridge, the ride made for the riverside near Eden Court where speakers demanded more action on safe cycling in Inverness. 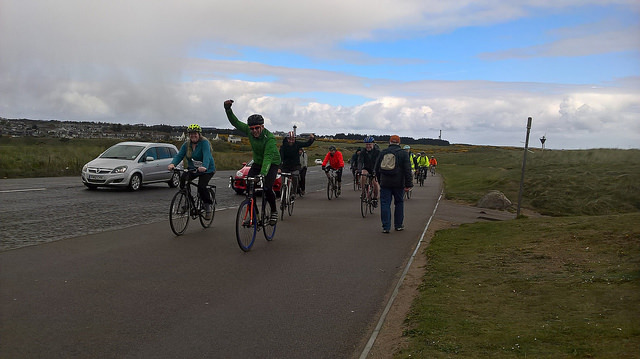 Inverness also had a feeder ride from North Kessock and participants came from as far away as John O’Groats. 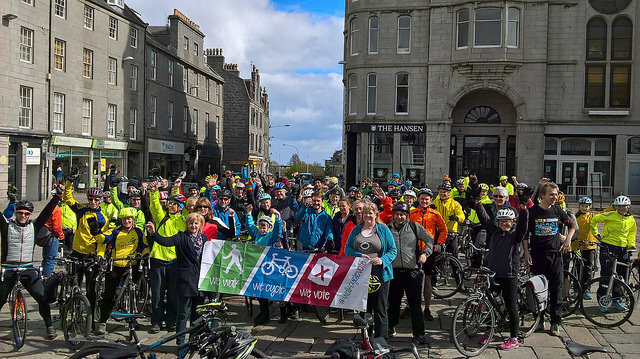 The crowd was addressed by John Finnie, Highlands and Islands Green MSP, and by Anne Thomas of Transition Black Isle, who both called for greater investment in cycling and walking infrastructure. Brian Mackenzie, convenor of the Highland Cycle Campaign, told the crowd, “You’ve made history, now it’s time to make the future”, while Mark Falconer, one of the main organisers of the event, told the crowd to contact their local politicians and show how much demand there is for better cycling provision. 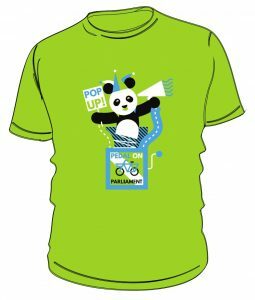 ← POP goes large in Glasgow!